A pulsar (from pulse and -ar as in quasar) is a highly magnetized rotating neutron star that emits a beam of electromagnetic radiation. This radiation can be observed only when the beam of emission is pointing toward Earth (much like the way a lighthouse can be seen only when the light is pointed in the direction of an observer), and is responsible for the pulsed appearance of emission. Neutron stars are very dense, and have short, regular rotational periods. This produces a very precise interval between pulses that ranges from milliseconds to seconds for an individual pulsar. Pulsars are believed to be one of the candidates for the source of ultra-high-energy cosmic rays (see also centrifugal mechanism of acceleration). The periods of pulsars make them very useful tools. Observations of a pulsar in a binary neutron star system were used to indirectly confirm the existence of gravitational radiation. The first extrasolar planets were discovered around a pulsar, PSR B1257+12. Certain types of pulsars rival atomic clocks in their accuracy in keeping time. 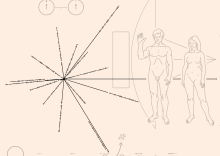 The first pulsar was observed on November 28, 1967, by Jocelyn Bell Burnell and Antony Hewish. They observed pulses separated by 1.33 seconds that originated from the same location in the sky, and kept to sidereal time. In looking for explanations for the pulses, the short period of the pulses eliminated most astrophysical sources of radiation, such as stars, and since the pulses followed sidereal time, it could not be man-made radio frequency interference. When observations with another telescope confirmed the emission, it eliminated any sort of instrumental effects. At this point, Bell Burnell said of herself and Hewish that "we did not really believe that we had picked up signals from another civilization, but obviously the idea had crossed our minds and we had no proof that it was an entirely natural radio emission. It is an interesting problem—if one thinks one may have detected life elsewhere in the universe, how does one announce the results responsibly?" Even so, they nicknamed the signal LGM-1, for "little green men" (a playful name for intelligent beings of extraterrestrial origin). It was not until a second pulsating source was discovered in a different part of the sky that the "LGM hypothesis" was entirely abandoned. Their pulsar was later dubbed CP 1919, and is now known by a number of designators including PSR 1919+21 and PSR J1921+2153. Although CP 1919 emits in radio wavelengths, pulsars have subsequently been found to emit in visible light, X-ray, and gamma ray wavelengths. In 1974, Antony Hewish and Martin Ryle became the first astronomers to be awarded the Nobel Prize in Physics, with the Royal Swedish Academy of Sciences noting that Hewish played a "decisive role in the discovery of pulsars". Considerable controversy is associated with the fact that Hewish was awarded the prize while Bell, who made the initial discovery while she was his PhD student, was not. Bell claims no bitterness upon this point, supporting the decision of the Nobel prize committee. Generally, the regularity of pulsar emission does not rival the stability of atomic clocks. However, for some millisecond pulsars, the regularity of pulsation is even more precise than an atomic clock. For example, J0437-4715 has a period of 0.005757451936712637 s with an error of 6983170000000000000♠1.7×10−17 s. This stability allows millisecond pulsars to be used in establishing ephemeris time or in building pulsar clocks. is the electron density of the ISM. The dispersion measure is used to construct models of the free electron distribution in the Milky Way. 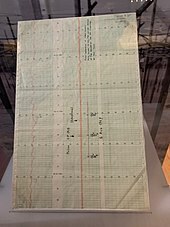 The first radio pulsar "CP 1919" (now known as PSR B1919+21), with a pulse period of 1.337 seconds and a pulse width of 0.04-second, was discovered in 1967. 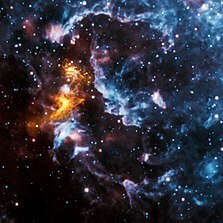 The longest period neutron star pulsar, PSR J0250+5854, with a period of 23.5 seconds. ^ "Definition of PULSAR". www.merriam-webster.com. ^ Sullivan, Walter (February 9, 1983). "PULSAR TERMED MOST ACCURATE 'CLOCK' IN SKY". NY Times. The New York Times. Retrieved January 15, 2018. ^ Bell Burnell, S. Jocelyn (23 April 2004). "So Few Pulsars, So Few Females". Science. 304 (5670): 489. doi:10.1126/science.304.5670.489. PMID 15105461. ^ Baade, W.; Zwicky, F. (1934). "Remarks on Super-Novae and Cosmic Rays" (PDF). Physical Review. 46 (1): 76. Bibcode:1934PhRv...46...76B. doi:10.1103/PhysRev.46.76.2. ^ Woltjer, L. (1964). "X-rays and Type I Supernovae". Astrophysical Journal. 140: 1309. Bibcode:1964ApJ...140.1309W. doi:10.1086/148028. ^ Pacini, F. (1967). "Energy Emission from a Neutron Star". Nature. 216 (5115): 567–568. Bibcode:1967Natur.216..567P. doi:10.1038/216567a0. ^ Gold, T. (1968). "Rotating Neutron Stars as the Origin of the Pulsating Radio Sources". Nature. 218 (5143): 731–732. Bibcode:1968Natur.218..731G. doi:10.1038/218731a0. ^ Weisberg, J.M. ; Nice, D.J. & Taylor, J.H. (2010). "Timing measurements of the relativistic binary pulsar PSR B1913+ 16" (PDF). The Astrophysical Journal. 722 (2): 1030–1034. arXiv:1011.0718. Bibcode:2010ApJ...722.1030W. doi:10.1088/0004-637X/722/2/1030. ^ D. Backer; Kulkarni, Shrinivas R.; Heiles, Carl; Davis, M. M.; Goss, W. M. (1982). "A millisecond pulsar". Nature. 300 (5893): 315–318. Bibcode:1982Natur.300..615B. doi:10.1038/300615a0. ^ a b Buckley, D. A. H.; Meintjes, P. J.; Potter, S. B.; Marsh, T. R.; Gänsicke, B. T. (2017-01-23). "Polarimetric evidence of a white dwarf pulsar in the binary system AR Scorpii". Nature Astronomy. 1 (2): 0029. arXiv:1612.03185. Bibcode:2017NatAs...1E..29B. doi:10.1038/s41550-016-0029. ISSN 2397-3366. ^ Marsh, T. R.; Gänsicke, B. T.; Hümmerich, S.; Hambsch, F.-J. ; Bernhard, K.; Lloyd, C.; Breedt, E.; Stanway, E. R.; Steeghs, D. T. (September 2016). "A radio-pulsing white dwarf binary star". Nature. 537 (7620): 374–377. arXiv:1607.08265. Bibcode:2016Natur.537..374M. doi:10.1038/nature18620. PMID 27462808. ^ a b "Pulsars". www.cv.nrao.edu. ^ "Old Pulsars Still Have New Tricks to Teach Us". Staff. ESA. 26 July 2006. Retrieved 30 April 2013. ^ "Voyager – The Spacecraft". voyager.jpl.nasa.gov. ^ Marissa Cevallos, Science News,"HOW TO USE A PULSAR TO FIND STARBUCKS", Discovery News, Wed Nov 24, 2010 10:21 am ET . ^ Angelo Tartaglia; Matteo Luca Ruggiero; Emiliano Capolongo (2011). "A null frame for spacetime positioning by means of pulsating sources". Advances in Space Research. 47 (4): 645–653. arXiv:1001.1068. Bibcode:2011AdSpR..47..645T. doi:10.1016/j.asr.2010.10.023. ^ John G. Hartnett; Andre Luiten (2011). "Colloquium: Comparison of Astrophysical and Terrestrial Frequency Standards". Reviews of Modern Physics. 83 (1): 1–9. arXiv:1004.0115. Bibcode:2011RvMP...83....1H. doi:10.1103/RevModPhys.83.1. ^ Matsakis, D. N.; Taylor, J. H.; Eubanks, T. M. (1997). "A Statistic for Describing Pulsar and Clock Stabilities" (PDF). Astronomy and Astrophysics. 326: 924–928. Bibcode:1997A&A...326..924M. Retrieved 2010-04-03. ^ Backer, Don (1984). "The 1.5 Millisecond Pulsar". Annals of the New York Academy of Sciences. 422 (Eleventh Texas Symposium on Relativistic Astrophysics): 180–181. Bibcode:1984NYASA.422..180B. doi:10.1111/j.1749-6632.1984.tb23351.x. Archived from the original on 2013-01-05. Retrieved 2010-02-14. ^ "African Skies 4 – Radio Pulsar Glitch Studies". ^ Ferrière, Katia (2001). "The Interstellar Environment of Our Galaxy". Reviews of Modern Physics. 73 (4): 1031–1066. arXiv:astro-ph/0106359. Bibcode:2001RvMP...73.1031F. doi:10.1103/RevModPhys.73.1031. ^ Taylor, J. H.; Cordes, J. M. (1993). "Pulsar Distances and the Galactic Distribution of Free Electrons". Astrophysical Journal. 411: 674. Bibcode:1993ApJ...411..674T. doi:10.1086/172870. ^ Rickett, Barney J. (1990). "Radio Propagation Through the Turbulent Interstellar Plasma". Annual Review of Astronomy and Astrophysics. 28: 561–605. Bibcode:1990ARA&A..28..561R. doi:10.1146/annurev.aa.28.090190.003021. ^ Rickett, Barney J.; Lyne, Andrew G.; Gupta, Yashwant (1997). "Interstellar Fringes from Pulsar B0834+06". Monthly Notices of the Royal Astronomical Society. 287 (4): 739–752. Bibcode:1997MNRAS.287..739R. doi:10.1093/mnras/287.4.739. ^ a b Angelil, R.; Saha, P.; Merritt, D. (2010). "Towards relativistic orbit fitting of Galactic center stars and pulsars". The Astrophysical Journal. 720 (2): 1303–1310. arXiv:1007.0007. Bibcode:2010ApJ...720.1303A. doi:10.1088/0004-637X/720/2/1303. ^ Deneva, J. S.; Cordes, J. M.; Lazio, T. J. W. (2009). "Discovery of Three Pulsars from a Galactic Center Pulsar Population". The Astrophysical Journal Letters. 702 (2): L177–182. arXiv:0908.1331. Bibcode:2009ApJ...702L.177D. doi:10.1088/0004-637X/702/2/L177. ^ Abt, Helmut A. (May 2011). "The Age of the Local Interstellar Bubble". The Astronomical Journal. 141 (5): 165. Bibcode:2011AJ....141..165A. doi:10.1088/0004-6256/141/5/165. ^ Buckley, D. A. H.; Meintjes, P. J.; Potter, S. B.; Marsh, T. R.; Gänsicke, B. T. (2017-01-23). "Polarimetric evidence of a white dwarf pulsar in the binary system AR Scorpii". Nature Astronomy. 1 (2): 0029. arXiv:1612.03185. Bibcode:2017NatAs...1E..29B. doi:10.1038/s41550-016-0029. ISSN 2397-3366. ^ Tan, C. M.; Bassa, C. G.; Cooper, S.; Dijkema, T. J.; Esposito, P.; Hessels, J. W. T.; Kondratiev, V. I.; Kramer, M.; Michilli, D.; Sanidas, S.; Shimwell, T. W.; Stappers, B. W.; van Leeuwen, J.; Cognard, I.; Grießmeier, J.-M.; Karastergiou, A.; Keane, E. F.; Sobey, C.; Weltevrede, P. (2018). "LOFAR Discovery of a 23.5 s Radio Pulsar". The Astrophysical Journal. 866 (1): 54. arXiv:1809.00965. Bibcode:2018ApJ...866...54T. doi:10.3847/1538-4357/aade88. ^ O'Brien, Tim. "Part-time pulsar yields new insight into inner workings of cosmic clocks | Jodrell Bank Centre for Astrophysics". www.jb.man.ac.uk. Retrieved 23 July 2017. ^ Champion, David J.; Ransom, S. M.; Lazarus, P.; Camilo, F.; Bassa, C.; Kaspi, V. M.; Nice, D. J.; Freire, P. C. C.; Stairs, I. H.; Van Leeuwen, J.; Stappers, B. W.; Cordes, J. M.; Hessels, J. W. T.; Lorimer, D. R.; Arzoumanian, Z.; Backer, D. C.; Bhat, N. D. R.; Chatterjee, S.; Cognard, I.; Deneva, J. S.; Faucher-Giguere, C.-A. ; Gaensler, B. M.; Han, J.; Jenet, F. A.; Kasian, L.; Kondratiev, V. I.; Kramer, M.; Lazio, J.; McLaughlin, M. A.; et al. (2008). "An Eccentric Binary Millisecond Pulsar in the Galactic Plane". Science. 320 (5881): 1309–1312. arXiv:0805.2396. Bibcode:2008Sci...320.1309C. doi:10.1126/science.1157580. PMID 18483399. ^ Knispel, B.; Allen, B; Cordes, JM; Deneva, JS; Anderson, D; Aulbert, C; Bhat, ND; Bock, O; et al. (2010). "Pulsar Discovery by Global Volunteer Computing". Science. 329 (5997): 1305. arXiv:1008.2172. Bibcode:2010Sci...329.1305K. doi:10.1126/science.1195253. PMID 20705813. ^ Pletsch, H. J.; Guillemot; Fehrmann, H.; Allen, B.; Kramer, M.; Aulbert, C.; Ackermann, M.; Ajello, M.; De Angelis, A.; Atwood, W. B.; Baldini, L.; Ballet, J.; Barbiellini, G.; Bastieri, D.; Bechtol, K.; Bellazzini, R.; Borgland, A. W.; Bottacini, E.; Brandt, T. J.; Bregeon, J.; Brigida, M.; Bruel, P.; Buehler, R.; Buson, S.; Caliandro, G. A.; Cameron, R. A.; Caraveo, P. A.; Casandjian, J. M.; Cecchi, C.; et al. (2012). "Binary millisecond pulsar discovery via gamma-ray pulsations". Science. 338 (6112): 1314–7. arXiv:1211.1385. Bibcode:2012Sci...338.1314P. doi:10.1126/science.1229054. PMID 23112297. Stairs, Ingrid H (2003). "Testing General Relativity with Pulsar Timing". Living Reviews in Relativity. 6 (1): 5. arXiv:astro-ph/0307536. Bibcode:2003LRR.....6....5S. doi:10.12942/lrr-2003-5. PMC 5253800. PMID 28163640.